Something had clearly been erased and a new word written in it’s place. I assumed “farmer” was the erased word. That’s the occupation I most often associated with my 2nd great-grandfather William Penrod CLARKE. And optician? Why would the census taker have written that? William was the second of 11 children born to shoemaker Morgan Henry CLARKE and his wife Susan (nee SHANK). William was just five years old when a Civil War battle took place in his home town of Funkstown Maryland. His mother died about 1875 when William was in his late teens. 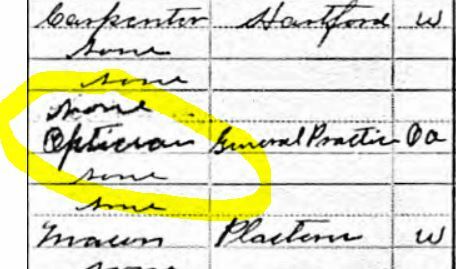 He’s listed as a laborer on a Maryland farm in the 1880 census. After relocating to Ohio while in his twenties, William married Mary Ella LITTRELL. Some members of Mary’s extended family farmed in the area. Others worked in a local machine shop. By June of 1900 William, Mary and their daughter Ellen Gertrude had moved to Chicago where William worked as a machinist. Another move before the 1910 census (the one in which William’s occupation was erased and replaced with “optician”); this time William and his wife relocated to Hartford Michigan. You may recall (from my timeline) that when the 1920 census was taken William and [Mary] Ella lived in Chicago with their daughter Gertrude and her husband Alfred. That census (taken in January of 1920) lists Williams’s occupation as shipping clerk for a mail order company. 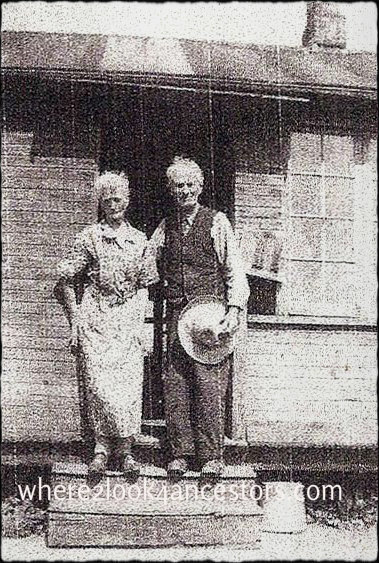 The couple returned to Michigan in time for the 1930 census where, in Bangor Township, William’s occupation was recorded as a general farmer. The return to Michigan was a permanent one since W.P. 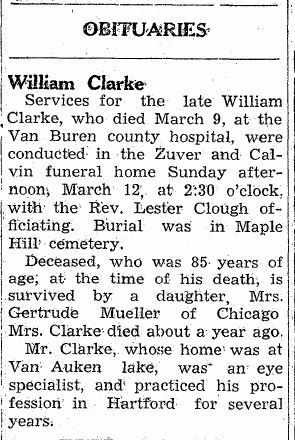 (as William’s name was recorded in the 1940 census for Bangor Township) and Mary were both 81 years old. In this census, William’s occupation is given as retired farmer. Both William and Mary Ella died in Michigan and were laid to rest there. I have only one (terrible) picture of William and Mary Ella. In it they are standing on the steps of what could be a farmhouse. So maybe William wasn’t a farmer all of his life. I conceded that during his younger years he was a machinist and a shipping clerk. But an optician? According to the 1940 census, William’s “highest grade of school completed” was 8. It wouldn’t have been possible for a man with an eighth grade education to be an optician…or would it? Fast forward to my preparation for that recent genealogy road trip. Although we wouldn’t be able to attend a meeting of the Van Buren Regional Genealogical Society, a visit to their web site provided links to area newspapers. After the trip, I devoted untold hours perused every spelling variation you can imagine the records for references to my Clarkes. It was an amazing journey during which I found 18 items (so far) that gave me greater insight into William’s and Mary’s lives in Michigan. However only one item mentioned anything optometry-related; William’s obituary. It appeared in the Hartford Day Spring, Hartford Michigan, page 2, column 3, on the 15th of March 1944. Is an obituary enough of a source for an occupation I can’t otherwise prove? I skimmed through numerous classifieds columns at random time periods to see if perhaps William ran ads about his optometry services, but couldn’t find anything. Just this morning it occurred to me I might have better luck if I used different tools in a different setting. So I printed the “Libraries that Have It” list for the Hartford Day Spring from Chronicling America to bring to my local library. Maybe an old-fashioned microfilm search is the way I’ll learn the story behind this census mistake that wasn’t! My first reaction was that since opticians make glasses (they do not treat eyes or even administer eye tests), perhaps his time as a machinist was working on machines that made glasses. I don’t think you’d need an education for that, at least back then, as it was more a trade than a profession. I don’t know that for sure, but that’s my first guess. Thanks Amy, I was leaning that way too. And the 1920 census occupation of “shipping clerk for a mail-order company” could be a reference to mailing eyeglasses. I hope you find more answers! Thank you Any – me too! It’s such a small world, I s’pose it’s possible!